original.kerchi: 1Utama Wonder Food Adventure ! Are you ready to go for FOOD HUNTING ?! YAYYY! Please prepare yourself for super yummy food pictures ! This is a gonna be a post totally all about FOOD ! Which i'm sure everyone loves ! But the common thing that most of us face when we go out to eat with a bunch of people : the hardest question in the world would be " WHERE/WHAT TO EAT ?!" So if you're like me, do read continue reading this post, cause 1 Utama together with The Butterfly Project organise a WonderFood Adventure for 50 lifestyle bloggers to go around 1 Utama's Food Street to explore the wide variety of all the awesome eateries ! ! This is actually my first FOOD HUNTING ADVENTURE ! So i'm really lucky and CRAZILY EXCITED to be able to be invited by The Butterfly projects ! FYI : 1 UTAMA is the WORLD's 4th LARGEST MALL ! Before starting my food adventure, wanted to just let you know why you should visit 1 Utama's Food Street ? Because it awesome ! YAYYYYYYY! haha. (Obviously is not just that !) *Ahem, seriously face ! Because 1 Utama's Food Street had a wide variety of authentic local street food that will fix any craving (savoury or sweet ! ) ! No need to travel to Penang or Melaka to eat street food anymore, just drop by 1 Utama Food Street ! To Begin My journey ! For this WonderFood Adventure, there are 15 eateries for bloggers to explore. But there are TOP 5 places which is a MUST VISIT ! and the rest of the eateries is really up to our stomach to decide ! When i first receive the invite from Tammy (our Butterfly Project's MAMAsang ! Who always take good care of us ! :) ) I was super excited ! Not only that, I had that "CHALLENGE ACCEPTED" meme face to prepare my stomach to be able to eat as much as possible ! Ninja Joe is actually the very 1st on the list, and when we arrived. Not many people was there eating, so we decided to have that first. Btw, it's self-service. Well, people always say you have to work hard for good things, right ? We both ordered the HIKKORI burger ! It's served with suckling bacon strips that will BLOW YOUR MIND AWAY ! the "fake" candid. but we all know i'm posing. I know my photography skills are not so good. But the Burger is AWESOME ! I saw this on their table. I was so impressed that Ninja Joe is MSG-free ! Ko Hyang serves a wide range of traditional korean cuisine. It has a really simple, neat and clean enviroment.. Ko Hyang Korean Country Delights menu is based on authentic Korean home cooked food which also includes dessert, soup, appetizers, noodles & rice dishes. It's really suitable for Asian palate, which everyone will enjoy ! I got the KIMCHI SOUP with Brown Rice. Just so you know... I was FULL after the second stop ! T.T ! Most people (including me), usually won't try street food like this in shopping malls. But please take my word , this is one of the "BEST" omelette oyster i have ever eaten ! No joke ! I tried the one in penang, also cannot fight ! Look at the size of the Oyster ! This is how big the oyster is ... I wasn't kidding right ! HUGE ! We also ordered their fried noodles. But... we were too full. So DaPao..
SS2 Goreng Pisang, serves many different type of goreng goreng (fried*) snacks, such as, fried banana, yam, sweet potatoe, fried popiah and many more. They are the mother of all Goreng ! haha. This is the Size of their fried Sweet potatoe ! 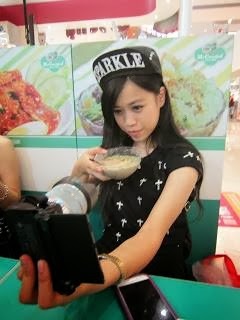 A selca with a snack is a must weihh.. haha.. I LOVE YOU ! 老油鬼鬼 ! I LOVE YOU ! 老油鬼鬼 ! is famous for their crunchy you tiao, freshly made Tafu Fa and their Porridge .. Their main aim, is to create a traditional taste which have a modern twist in it. The Food here is really suitable for people who are rushing and want to grab something light and easy. & on top of that the pricing is really reasonable. My sis and I ordered their red bean paste bun and their normal (kosong) bun with their soya milk ! Eat & Happy Yong Tau Foo. Eat their Yong Tau Foo and be Happy ! haha. They have many choices of Yong Tau Foo for you to choose. I didn't got a chance to try their Yong Tau Foo, cause i was overly full and can't really eat. But i just stop by to take some pictures and of cause to get my passport stamped. The pricing here is not too bad, it's actually quite reasonable. My sister have been craving to eat this seaweed popiah for months..
and when she saw that Seaweed Club was one of the eateries, she kept saying " Wahhhh, later must come, must come !" hahaha.. Dream come true ! Seaweed club serves a very unique popiah wrap with seaweed ! Seaweedlious ! hahaha.. There have 5 different types of flavor to choose from, Normal, Spicy, Wasabi, Tuna & Vegeterian. Previously i mention that i love eating spicy food, so i'm sure you can guess what i ordered ! Finally a dessert ! haha. YAYYYYYY ! Actually my sister is the one with the sweet tooth. But lately my craving for sweet food has increased ! So coming to Bisou to satisfied my sweet craving.. but they packed in a box with a sticker on the box, so i decided bring home to eat in the end. Bisou sells a huge variety of dessert like , cupcakes, cakes, cookies & etcc..
Bisou is also having a promotion now for their cupcake. Buy 5 get 1 free ! Admiring all the pretty cupcakes ! Just found out that there have one in 1 Utama. Don't have to go all the way down to my hometown to enjoy good Cendol ! A picture (On the left) taken by Choy Peng while I'm taking my Selca with my cendol. HAHAHAHA! Come over to Molten Lava to satisfied all your dessert craving. There serve many different types of Swissroll, macarons and Cinnamon Churros, which was actually specially picked by Molten Lava for bloggers to try. BBQ Chicken was one the stops that i didn't manage to try their food. But no worries, I'm sure there are many other bloggers who went there to eat. You can go check them out. Will definitely come back to try this place, better than you eat other fast food. There are a variety of grilled, fried & (of cause) BBQ-ed chicken ! Vivo serves the best American style Pizza in town because they use a traditional method of baking the pizza. After 30 years of making pizza, they have combine the traditional method with latest technology to maintain the standard of their Delicious Pizza ! Vivo is last and most satisfying stop ! Soon enough you will know why.. haha. Despite, both of us being super duper full and partly tired after so many food stops. We just came in to sit and see what do they have. When they said we can choose between pizza and a Volcanic Chocolate with Ice cream.. (which will you choose?... of cause DESSERT !) but we ordered a pizza and a dessert.. & then we dapao the pizza back! haha..
See why i say this is the best stop ! See My HAPPY EXPRESSION ! That is the end of my Adventure ! I'm was so fully and satisfied ! I was able to touch all the taste buds on my tongue ! But there were stops that i missed, cause it was almost 4pm and i was FREAKING FULL & tired ! haha.. The Outlets that i missed were : Lammeeya & Pao Xiang Bak Kut Teh ! (I heard from other bloggers that there serve really good and delicious food !) Maybe you all should go and try and let me know how it taste like.. hehe..
Before ending this amazing adventure, 1 Utama gave all of us a ONECARD membership together with a RM50 gift card! YAYYYYYYY! ONECARD is a 1 Utama's official privilege card. What so special about this card, if your asking?.. You are able to earn UPoints by just spending money at participating outlets. Every RM1 you spend you will earn 1 UPoint, with all the points you collect you can just use the points like cash to do instant purchases, meals, services and entertainment ! Not only that, ONECARD can also be used as a prepaid parking ticket for hassle-free parking. It works as a eco-friendly initiative to reduce the use of parking tickets. With ONECARD membership, you are also able to have an exclusive entry to members-only parking at ONECARD Preferred Parking & Platinum Parking area at a CHEAPER RATE !! Isn't it GREAT ! ! Thank you 1 Utama for loving us so much ! This is my super cute ONECARD ! Loving this cute little power bank ! Once again would like to thank you 1 Utama for having us to join this AMAZING FOOD ADVENTURE ! And also thanks to The ButterFly Team who organized this event for all of us ! Btw, for more info, go to > www.1utama.com.my , www.onecard.com.my or www.facebook.com/1Utama ! & Don't forget to LIKE The Butterfly Projects Facebook @ www.facebook.com/ButterflyProjectMalaysia ! SHOW THEM YOUR LOVE ! That's all for this super long and delicious post..